Are you puzzled by the complex uses of the Spanish verbs SER and ESTAR? Both words refer to a similar concept, "to be." Perhaps you have studied these two versions of "to be," but you are still unsure about which verb fits into your Spanish sentences. Deciding on the correct verb can be challenging! 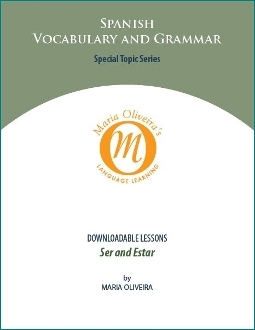 This downloadable Spanish lesson reviews the various expressions of "to be" and provides practice for using both Ser and Estar correctly. The lesson is divided into three parts that include a comprehensive explanation, relevant practice, and reinforcement for complete learning. First, a detailed discussion of Ser and Estar makes sure that you have all the rules of usage. Then, practice exercises demonstrate the rules and provide the repetition necessary for a thorough understanding of the subject. Finally, the answers to the exercises are shown along with detailed explanations for each answer. Completion of this lesson will boost your conversational Spanish skill level as well as your confidence in using these important and challenging verbs.